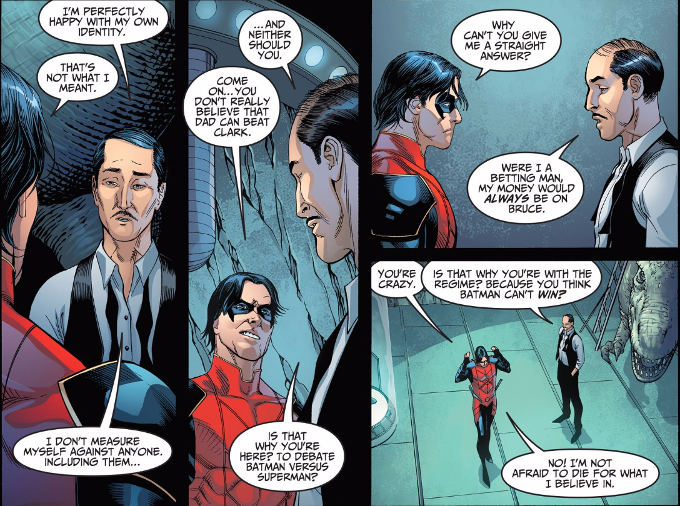 Damien Wayne returns home to Gotham City. Partly to confront Alfred on the reasons for his loyalties in the battle to come. But also to protect the city his father once called home from criminals. Criminals like Catwoman and Harley Quinn, who have seemingly abandoned Batman's Insurgency in order to return to their wicked ways. One wonders how Alfred can still be at liberty in Gotham City, given his known association with Bruce Wayne. Could Superman not yet be so far gone as to go after someone he sees as an innocent or does he just remember the sound thrashing that Alfred gave him when the playing field between them was even by in Injustice: Year One? It doesn't really matter in the end, but the interplay between all the characters as written by Brian Buccellato brings such questions to mind. There are some truly great character moments here, with Alfred explaining why he believes Batman will always beat Superman and it has nothing to do with him always having a plan or a piece of Kryptonite. It's a nice bit of metatextual commentary on Batman v. Superman as well. Alas, Mike S. Miller seems to have phoned it in on this issue. Individual panels are rendered well enough but some of the actual poses and expressions seem a bit off. 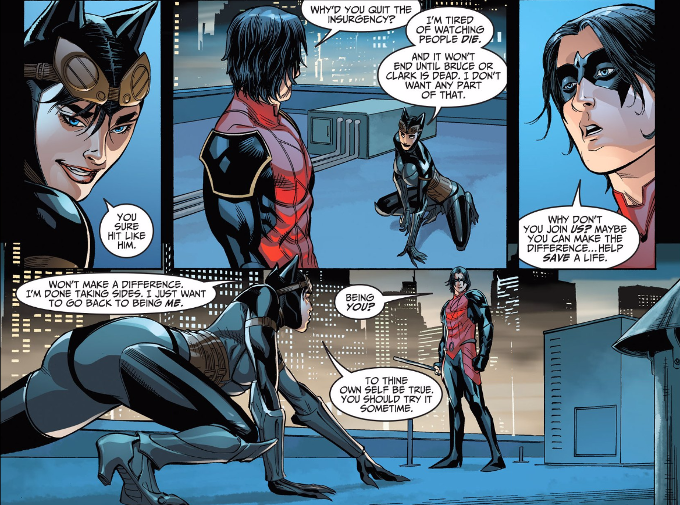 Damien Wayne appears to be stoned at one point and Catwoman mysteriously seems to don a black thong over her catsuit. The whole issue just looks odd and off-putting!